The games were simple such as this basketball/powerball. The Black squares are bad, try to avoid them. As much as we praise original games, it need to be said, at times they are very hit and miss. For every Lemmings like instant classic, you have thousands of other games that just don’t quite work. Another hit and miss concept is games based on the TV Show – The Simpsons. The arcade game was great, but you have turkeys like Simpsons Wrestling as well. So, could a game which pitted The Simpons (particularly Bart) against the might of The Juggernauts (Springfield’s answer to the Gladiators) actually work? The game really doesn’t have much of a storyline, just one day Bart applied to appear on The Juggernauts to win cash, and the sadistic programme producer put him in to see how he fairs. That’s pretty much about it. I’ll be honest, it isn’t actually explained that well, even by the commentators for the Juggernauts, which are Dr. Marvin Monroe and Kent Brockman. 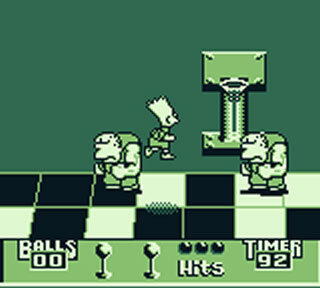 Anyway, in the game you play Bart Simpson, who has to compete in 6 Gladiator esque games. I say Gladiator-esque, some (including the Joust and Powerball) are a direct rip of their TV compatriates. There’s also a wrestling game (a dire warning towards the future Simpsons Wrestling – it’s the weakest event in the game), a skateboard event, a platforming event and a whack a mole esque game. Each one event has a similar theme – you need to complete the tasks as many time as possible (with the Juggernaut trying to stop you), or defeat the Juggernaut in the allotted time. Depending on your performance, you get money. Beat the target amount for that week and you progress to the next week. Beat 4 weeks of the events and you get crowned champion. The events are pretty much minigames, and are styled on some of Springfield’s characters. For example, Mr. Burns is in charge of the Joust event, it takes place on two nuclear cooling towers above a vat of nuclear waste, and the pugil sticks are uranium rods. That’s the description anyway. You need to suspend your notion of reality for this event, and many of the others, as they often take place in fantasy situations. Nevertheless, whilst there’s only six minigames, all but one are good fun. The game is pretty tough, in that you need to pretty much know the events off by heart to have any chance of winning. There are bonuses in some events, and there’s a bonus event should you win all events. This game is never going to change the world, but it is a great game to pass a car journey. 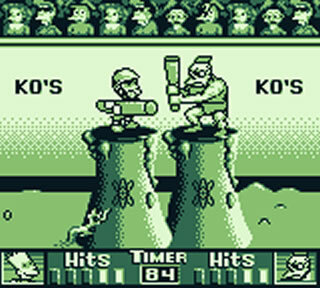 The graphics are both good and easy to see on the ever troublesome Game Boy screen. The soundtrack really is the only thing that lets it down, it’s a bit repetitive, but other than that, you can do a lot worse for a Simpsons game, and a lot worse for a “Gladiators” game. Check it out.